ellehermansen: Healthy Creations: Fresh Gluten-Free Bakery! 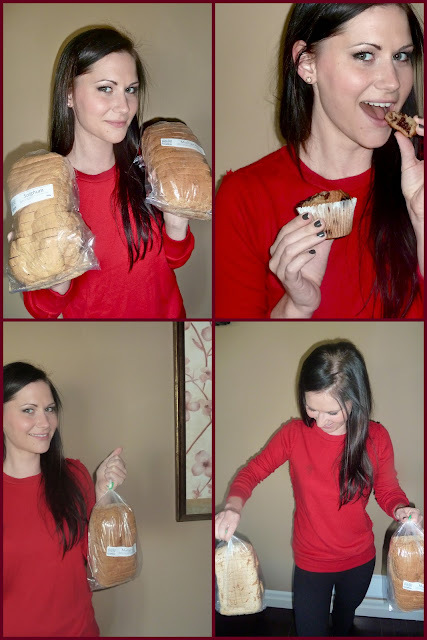 "How do you begin to pose with a loaf of bread?" I've been raving about this bakery for quite some time now, and I can't even believe I haven't written about it yet! I got a few fresh things today, as Thanksgiving weekend is creeping up on us, and as I was going through the photos I took of breads for hands. My sister-in-law creepingly messaged me if I had heard of "Healthy Creations Bakery" over Skype. I said it was freaky as said "I was just editing a post about it right now!!! "What a weird connection we have! Love you, Mandiemoon! So yes, Healthy Creations Gluten Free Bakery is to die for and I will forever go back! Best bread, muffins, pizza bottoms, cookies - ever! I enjoy that place so much! I took a picture of the very first business card (and only card) they gave me so it's a little bent, but it basically says everything on it that you need to know! There is nothing more cozy than bringing fresh warm bread home (that's a true bread winner! ;) and I've missed that experience for so many years, until now, and I am very much enjoy it! If you are in the London, Ontario - or surrounding area, I highly suggest you give it a try! You'll be hooked. Promise. Check out their website for more delicious details! The breads look yummy! Hopefully I can try a little of your stuffing!! Mmm!